It struck me the other day just how lucky I have been to have read runes, aligned chakras, meditated, theta-healed and visited psychics. I was certainly seeking something to put my faith in, but the biggest surprise has been how all my new age investigation prepared me perfectly for Jesus and the New Testament. 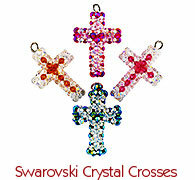 Crystal Crosses – Because every good SAP needs one. I’ve blogged before about how exhausting new age ‘thought creates’ ended up being. I could repeat ‘I create with ease’ mantras until I was blue in the face, but it struck me as particularly hit and miss. Some days it would flow, other days ‘ease’ seemed as remote as the moon. I’d be stuck asking, ‘If God (Spirit/Universe) created us as such magnificent, perfect beings (for one thing New Age teaches, is we are all perfect) how come I’m not finding this a little easier?’ And then, just to confuse things, despite me being perfect just as I am, paying for another chakra clearing, or past-life regression, would help me be just that little bit more perfect. I found aspiring to the new age ‘everything is awesome’ thought-creates vision tiring. Plus I’ve never been that good at naval-gazing for extended periods. I was sick of all this ‘self’ I was supposed to aspire to. Read a pack of Angel cards, and one instruction tells you that if you spot a feather on the floor, that’s because your angels are nearby working their magic. Other New Age/ gnostic writings refer to three as a sacred number – so if you see/read/hear something three times, that’s God (Spirit/Universe) trying to get a message through. The SAP may only sneeze over spotting a feather, but there are plenty of other ‘God moments’ – as he calls them – that come through signs, dreams and repetition. So new-age has prepared me for a very personable, relatable conversation with God and Jesus. I figure it’s meant to be personal or else that temple curtain wouldn’t have ripped during the crucifixion. The three of us go running each morning. I pay attention to what pops up after I’ve been praying for guidance. The answers come, without fail. The difference now, compared to my sign-seeking, new-age self, is both infinite and infinitesimal. Now I trust the answers, whilst before I wanted to, but my own self (doubt, ego) kept getting in the way. Prior to curing my Christian hangover, the closest I came to flow and true presence was on the yoga mat. I am lucky: I naturally do not tend towards a mind that is, as a monk once described to me, like ‘a mad monkey stung by a scorpion’. Yoga poses and striving towards non-attachment help keep that mad monkey sedated. Trouble is, we are born relational beings. We love, laugh, dance, dramatise, wound, weep and worry. A non-attached life gets a little devoid of colour. There’s a balance between non-attached emptiness, living in glorious Technicolour and not allowing yourself to be buffeted by any small scorpion sting. Non-attachment does help quieten the ego. Which gave me a fairly good place to start from when it came to meeting Jesus and God again. Becoming humble is a sign of inner strength, not – as we are quick to mistake in our self-led life – weakness. Bowing my head to accept, quite humbly, that I am less, makes me more. It takes some serious strength to pack away your self and admit, “I am so utterly flawed, but, but, YOU, God, think I’m worth saving – and there’s nothing I can do to make myself worthy of that.” Yoga’s path of non-attachment helped me move more easily towards the empty-handed humbleness required of a relationship with God. Christianity is the only religion that offers the ‘reward’ upfront. Grace. No boxes to tick, diets to follow, or self to flagellate. Jesus did all the hard yards. Our job is to get on with living gracefully. Yoga gave me glimpses of what I thought was ‘grace’ – the silenced mad monkey, a shining peacefulness – until a forthright Christian woman asked what I meant by glimpses. “But you’ve got it already,” she reminded me. There are no mere glimpses of grace on this Christian journey. It surrounds and astounds — you just need to keep accepting it. And one thing yoga is especially good at teaching is acceptance. Finally, at the risk of offending UHT Christians (those who have been working at this for a long, longer life than I), new age prepared me well because, once I got past hangovers and stereotypes, Christianity is far less difficult than new age. A bit like my slogan around Apple, ‘it just works.’ No gimmicks. No need to book in for a past-life regression and multiple ongoing appointments. Just accept you are more flawed than you can imagine, more loved than you can imagine, and get on with the business of grace. Plug and Play. So if it’s so easy, how come it’s got such a poor reputation? I’m cognisant that church and religion has sent many fleeing to the new-age hills. Been there, done that, bought the crystals myself. While pastors, vicars, minsters and priests play a key role in creating positive church experiences, I’ve reached the conclusion that it’s even simpler than that. Christians need to create positive Christian experiences. Put away the sin and grace barometers. Be flawed. Be real. Live and breathe grace every day, not just Sunday within some ‘hallowed walls’. God shoved me to a church that suited me, gave me a SAP on the end of a phone, and surrounded me with plenty of ‘real’ Christians. He knew I’d never have listened any other way. Amazing grace, indeed.